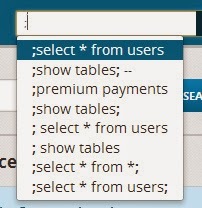 This kind of feature can be useful in helping users phrase their questions and find what they seek. Collecting search history can also provide useful information to those operating a site about the inquiries of their users. If a site doesn't provide content related to their users' searching, auto-suggest based on popular queries may just help people get to no help quicker. 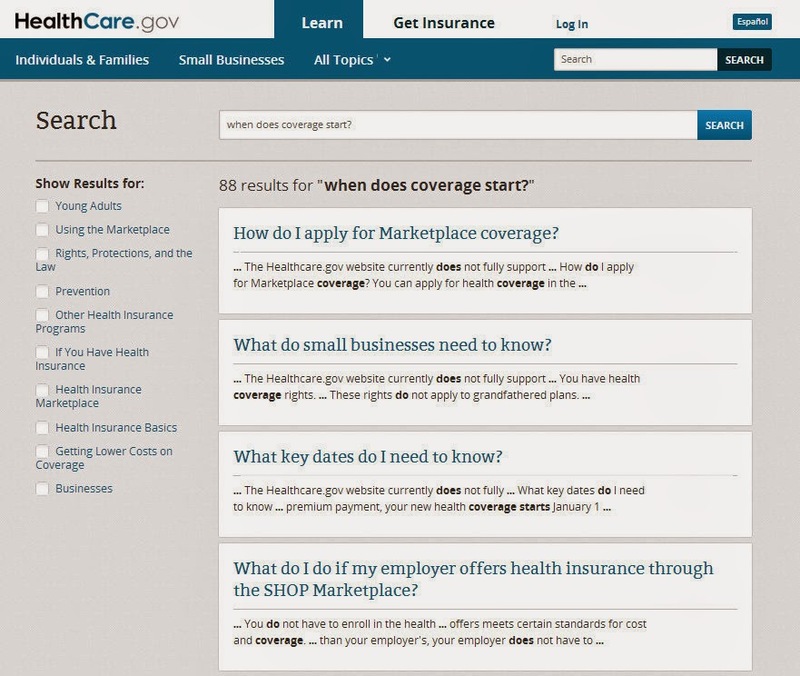 Let's take a look at searches being performed on Healthcare.gov. What happen's if I start with "what"? 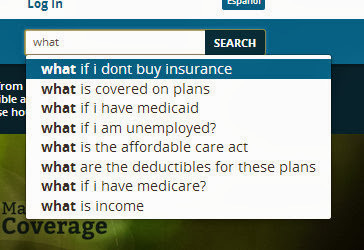 Those look like reasonable "what" questions. Let's look at results for the first one. Dental plan info. Job-based insurance. A one-page guide. 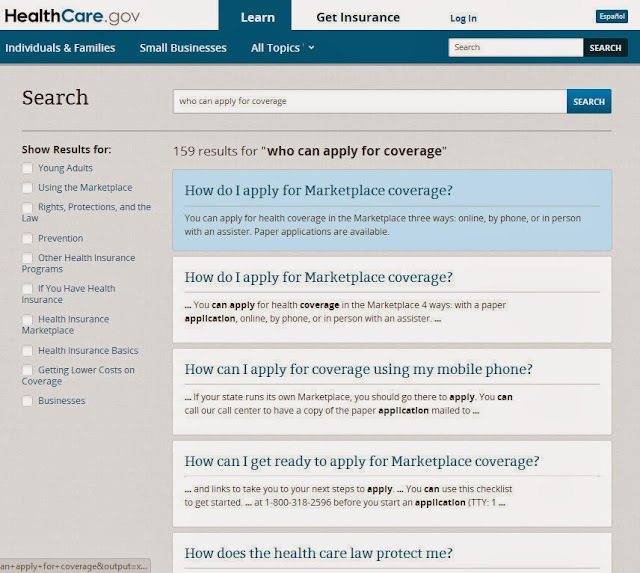 More employer insurance. Part timer. Hmm. I don't see anything obviously related to the suggested query "what if i dont buy insurance". The results for the suggested query aren't quite what I expected. 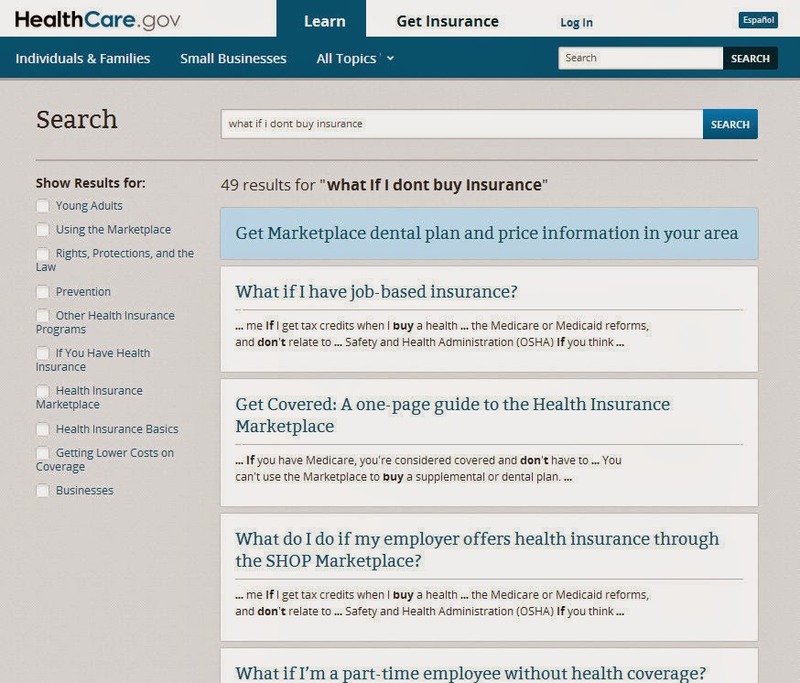 I would have expected the results to include something about the penalties for not buying insurance. Let me try asking it "what" again. Hmm. This time I get a slightly different set of suggestions for "what". What's up with that? Not much luck with "what". Let's try "who". Again, these look like questions I'd expect people to ask. 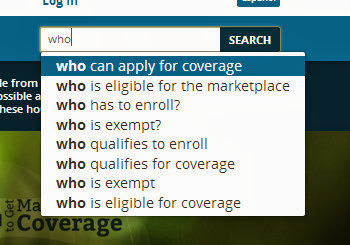 Let's see what results I get for the first suggestion: "who can apply for coverage". 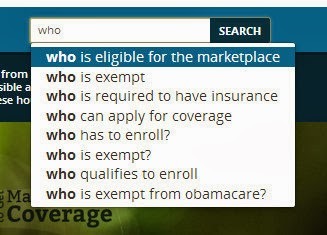 It seems to be providing results for "how", not "who". I ask "who" again. Once again, I get a different set of suggestions. There appears to be two different sets of suggestions for each auto-suggest look-up. Good question. 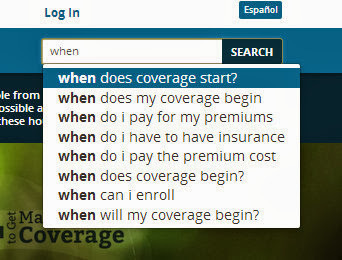 When does coverage start? Hey, I think I see something relevant in the results. The 3rd item appears to be relevant. I'm not so sure about the others. As before, let's see what happens if I ask "when" again. As before, I get a different set of suggestions than I got from my first query. 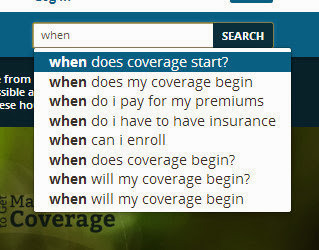 There seem to be many ways to ask when coverage starts. I wonder if they all return the same results. I'll try that later. If you want to know, you'll have to give it a try on your own. It does appear that the search engine could use some tuning. 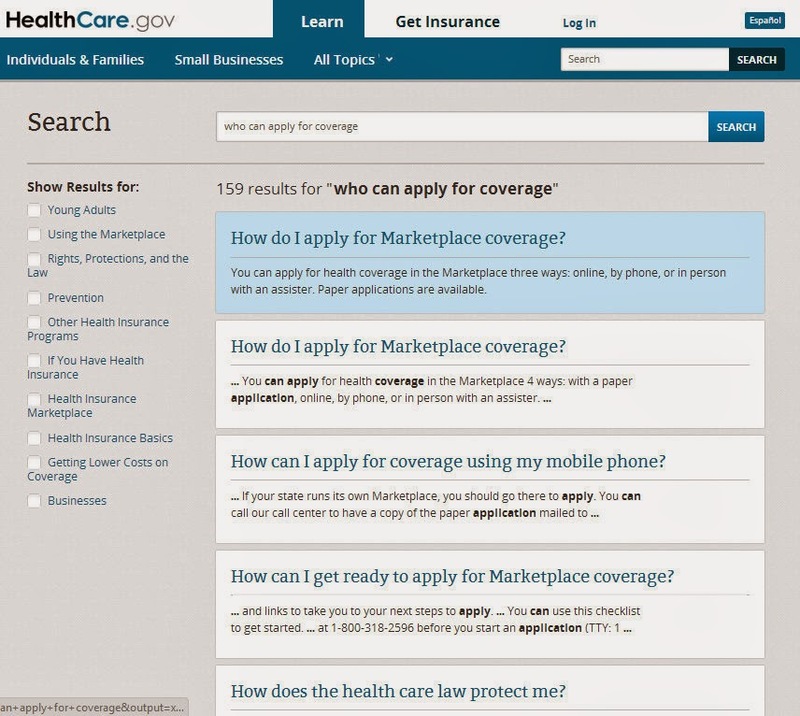 Or maybe the folks at Healthcare.gov need to add some help documents that answer the questions people are commonly asking -- the questions that Healthcare.gov is suggesting others also ask. One last thing. 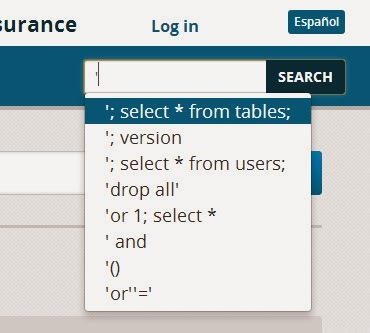 Let's see if anyone been trying to inject SQL or other code into the search feature. I type a single quote. I then try a semi-colon. If people are trying to inject code into the search engine, I suspect some are also trying similar attacks in other parts of the system. I think Not Joe may have a point. UPDATE 11/19: It appears that the search suggestions have been disabled. 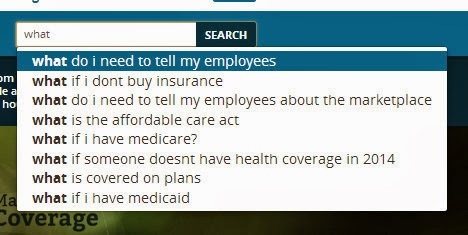 Given the more important issues that the Healthcare.gov people need to address, this is probably a good quick fix to showing unhelpful suggestions. However, I encourage the people at Healthcare.gov to use the search history to better understand their clientele so that they can tune the search engine and create relevant content. Perhaps they are already doing this.